This romantic couple met in The Gambia and kept in touch for 5 or 6 years before getting married at Coco Ocean Hotel in The Gambia, Christmas 2015. I was lucky enough to be their wedding photographer, the 5th wedding I have photographed in the Gambia since 2010. The image above is the one they chose to be on the cover of their wedding album. 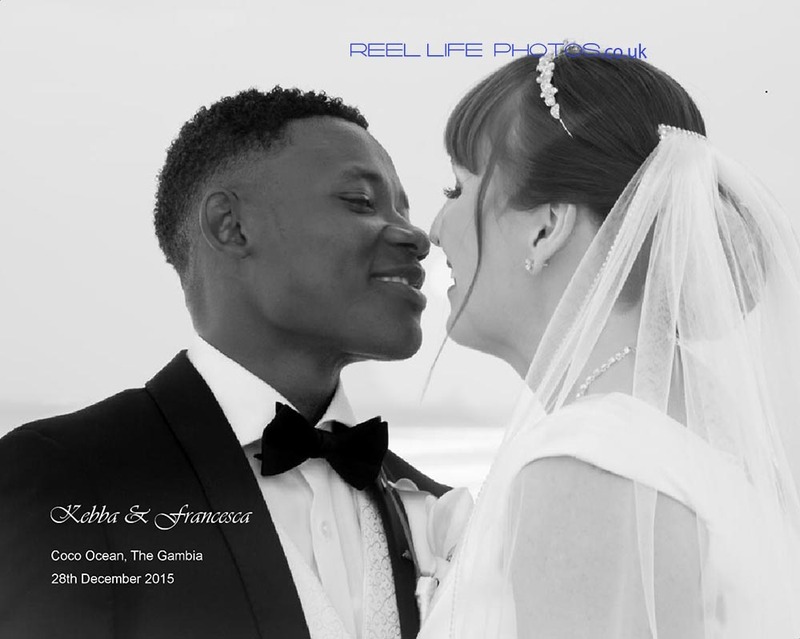 The bride really likes black and white wedding pictures, and this was the groom’s favourite photo from their wedding day at Ocean hotel and Spa in Kololi. I love beach weddings and this wedding venue in particular! The Gambian groom breaks with tradition, seeing his wife to be at the Royal Suite on their wedding day, as he brings the little flower girl there. All the little flower girls; and bridesmaid’s shoes lined up neatly in a row on the black and white tiled floor in the Suite’s cloakroom, ready to be worn at the wedding..
Black and white wedding photos of the bride’s mother and the bride getting ready in the Royal Suite at Coco Ocean Hotel and Spa in The Gambia. Bride has her tiara on as she looks on at the little flower girl inside the Royal Suite at Coco Ocean before the start of her wedding. Bride being helped on with her wedding dress, as her mum crawls underneath to sort out the underskirt in the Royal Suite before her wedding at Coco Ocean in The Gambia. Bride and bridesmaids leave the Royal Suite to go to the wedding on the beach at Coco Ocean Hotel. Groom and bestman waiting for the bride. The couple say their vows in a romantic beach wedding at Coco Ocean. Bride and groom’s mothers play a big role in this wedding. Just married at Coco Ocean then the register is signed. Sheer joy! Gambian family showers the newly weds with confetti at Coco Ocean. This entry was posted on Tuesday, July 19th, 2016 at 6:54 pm	and is filed under international wedding photography, Reel Life Photos Destination weddings worldwide, Reportage wedding photography, Storybook wedding pictures, wedding photography in The Gambia, wedding storybook albums, weddings abroad - destination wedding photography.. You can follow any responses to this entry through the RSS 2.0 feed. You can leave a response, or trackback from your own site.